A new Starmobile tablet has been announced and coming this September 13, 2013. A huge breakdown of great specification from this large screen smartphone. The Phablet has been featured to have a Dragon Trail Glass coating on its screen, Quad core processor, and full HD display. Capable of installing the latest apps in the Playstore, thanks to Android Jelly Bean 4.2. Diamond V7 has also been featured with the same camera specs as the Cherry Mobile Cosmos Series, that is 18MP back camera with BSI technology, and 8MP front camera still with BSI technology. Though, compared to the cosmos series Starmobile Diamond V7 will be slightly expensive at the price of Php12,990 and it comes with free 8GB MicroSD memory card, Flip Case, Screen Protector, and stylus. Maybe that's the reason why the price is slightly higher, which I guess the freebies are not free after all. More info below. It has been a great demand of Filipino consumer in buying smartphones with huge battery capacity, lest some other brands offer awesome specs at an affordable price, but when it comes to battery level, they totally ruin the game. 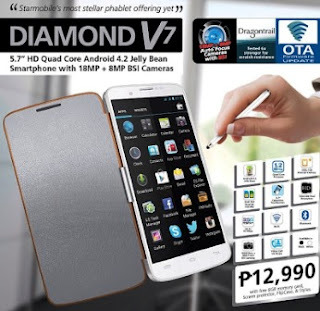 Bu not for Starmobile Diamond V7, adding a few buck for battery life is not a bad idea. FOTA or firmware over-the-air update, which enables Diamond V7 to update its firmware without the need for PC, just simple internet connection (preferably WiFi) is enough to run the show, just be sure you have enough battery (at least 80%). For Php12,990 | Available this Friday, September 13, 2013 in the Philippines. 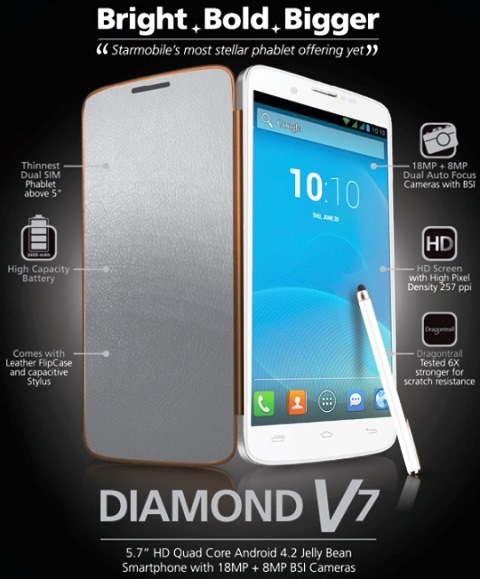 Comes with free 8gb memory card, flip case, screen protector, and stylus.